“Erma Mae Funk, 74, died at her home on Stony Hill, Whigville, on July 8, 1980 after a long illness. She was the daughter of Emil H. and Jessie (Austin) Funk. A graduate of Federal Hill (Patterson) School, Mount Holyoke College - in volunteering summers for the Bristol Family Services - and the New York School of Social Work. “In July 1928, Judge William Malone of the city court announced the appointment of Erma Funk as Bristol’s first woman probation officer - and the youngest in the state - for the remainder of the court year term to May 1, 1929. “In her report to the city council on Jan. 15, 1929, she had held 375 interviews, made 115 home visits and investigated 29 complaints. At this time she requested a part-time stenographer to take care of the office work and some provision to be made for juvenile delinquents so that they need not be kept with adult criminals in the police station. Her requests were approved by the city council. The men’s probation officer was Thomas A. Tracy when she first started and later Thomas Monahan upon the death of Mr. Tracy in 1937. “She was appointed to the Third District Court working with Judge Thomas G. Gill in 1942. When the Juvenile Court for the State of Connecticut was established. Miss Funk was always interested in court work and welcomed the opportunity to work with the Bristol court system, which she never regretted. As a self-evaluation in a way, she said there was always something interesting going on and that it was a challenge and privilege to work in the court. “Erma’s outgoing personality and interest in people were hallmarks in her pursuits. She was a pioneer in the establishment of the Bristol Girls Club serving as one of the 12 original incorporators. In addition, she served on the Board of Directors of the Boys Club and Bristol Youth Council. “In 1955, Erma helped to organize a child guidance program which grew into what was known as Wheeler Affiliates (now Wheeler Clinic). 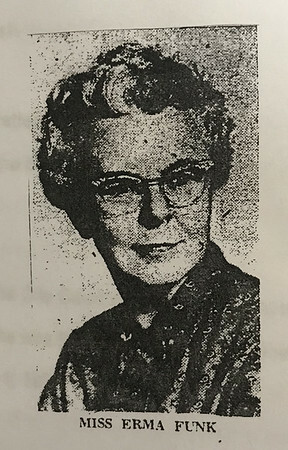 Her great concern about health services for grammar school children and senior citizens led to the formation of the Burlington Visiting Nurse Association. “One of her favorite pastimes was skiing and as an avid dog lover, she judged and bred Great Danes for many years. Active in several organizations in Burlington and Bristol, particularly the Bristol Garden Club, her beautiful garden featured first prize roses in addition to blueberries, raspberries and currants. “A feature article in the Bristol Press (Aug. 14, 1975) stated that she had a lovely figure and complexion. She attributed this fact to a proper diet, exercise and abstinence from alcohol and cigarettes. Her life was modeled by the philosophy of doing for others. “She was unique because she had accomplished so very much without seeking praise. Her charming personality, zest and fervor exemplified compassion, honesty and sincerity, all qualities which are rarely found. Posted in The Bristol Press, Bristol, General News on Sunday, 10 February 2019 20:12. Updated: Sunday, 10 February 2019 20:14.